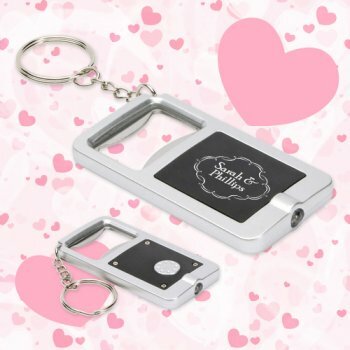 Personalized LED key light wedding favor bottle opener keychain – silver/black adds shine to your celebrations with its specialized features. 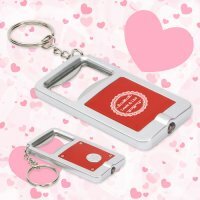 This item bears a single white LED light, integrated bottle opener, key ring, and button cell battery, which makes it one impressive travel item, too. It would impress all those young party birds flocking your party and wishing to have a great bonding time over drinks. You can either slip it into the wedding tote bag or hand it individually to each guest. 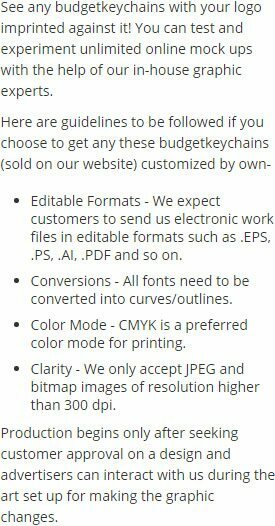 Request a quote to know wholesale savings for these custom wedding favors LED key light bottle opener keychains – silver/black. Features – Ultra bright single LED light, key ring, integrated bottle opener, and button cell battery inserted. Split metal ring. Approximate Size – 2-13/16" x 1-1/2" x 5/16"
Imprint Area : TOP : 1" x 0.75" , BOTTOM : 0.75" x 0.375"
Product Size : 2-13/16" x 1-1/2" x 5/16"